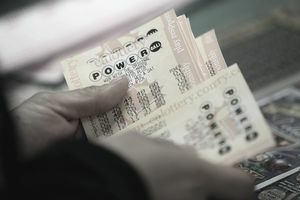 Powerball is a multi-state lottery run in all but six of the US states as well as the District of Columbia, Puerto Rico, and the US Virgin Islands. It replaced the Lotto*America lottery in 1992, becoming the first lottery game to use two drums to draw winners. One drum is used for the white balls and one for the red ball, which gives the Powerball Lottery its name. Winners are drawn on Wednesday and Saturday nights at 10:12 PM Central Time. The drawings are conducted at Universal Studios in Orlando, Florida. The winning numbers are announced on television, on the Powerball website, in newspapers, and online. In order to win the jackpot, players must correctly match all five white balls as well as the red Powerball. There is no guarantee that a jackpot will be awarded in every drawing. If all six numbers are not picked, then the jackpot rolls over to the next drawing. As jackpot values soar, more and more people tend to buy tickets, so a larger percentage of the possible number combinations are sold. Eventually, it becomes nearly impossible for a drawing to occur without a winner. The Powerball Lottery's jackpot starts at $40 million and grows by at least $10 million each time the jackpot is not awarded. The jackpot can, and often does, reach values of hundreds of millions of dollars. As of 2016, the largest lottery jackpot in the history of the world was a Powerball jackpot worth over $1.5 billion dollars. But there's more to Powerball than just the jackpot prizes. In every drawing, other cash prizes worth between $4 and $2,000,000 are also awarded. The value of the prizes depends on how many numbers a player has guessed correctly, and the number of prizes awarded in each drawing is limited only by how many people make correct guesses. How Much Does It Cost to Play Powerball? Basic Powerball cards cost $2 apiece. For an additional dollar, you can add the PowerPlay option, which increases the size of your prize if you correctly guess one to five qualifying numbers. So the maximum cost of a single Powerball ticket is $3. How Does the PowerPlay Option Work? If you purchase the PowerPlay option, the value of any prize you win for matching fewer than five balls will be multiplied by a randomly-drawn value between two and five. If the jackpot is worth less than $150 million, a 10x multiplier will be added to the mix. For the payouts for matching five or six balls, the PowerPlay option works differently. The million-dollar prize that's awarded for matching five white balls without the PowerBall is always doubled to $2 million with the PowerPlay option. The other multipliers don't come into play. The PowerPlay doesn't affect the size of the jackpot, which is fixed whether you purchase the PowerPlay option or not. No multipliers will be applied. When you buy your ticket, you'll select five numbers (these winning numbers will be drawn from the first drum with the white balls) and one Powerball number (the winning Powerball number will be drawn from the second drum with the red balls). You can choose your Powerball numbers or you can let the Powerball machine draw your numbers for you at random. The order of your first five Powerball numbers doesn't affect your chances of winning. So if you pick the numbers 1 3 9 13 17 and the Powerball 6, and the winning numbers come up 17 9 1 3 13 (6), you'll still win the jackpot. The red Powerball must be correctly guessed to count toward your winnings. *The exact payout will depend on whether a 2X, 3X, 4X, 5X, or 10X multiplier was drawn at random. The 10X multiplier is available only for jackpots worth less than $150 million. What Are the Odds of Winning Powerball? What Is the Powerball Multi-Draw Option? Powerball Multi-Draw lets you easily play the same numbers on up to 26 consecutive drawings at the same time. Using the Multi-Draw options helps ensure you don't miss a drawing. You can also choose the Future Drawing option on your Powerball ticket to play on specific dates. So if you feel like an upcoming date will be particularly lucky for you (maybe a birthday, anniversary, or a date containing a lucky number), you can be sure you won't forget to play on that day. Is There a Secret to Winning Powerball? The Powerball.com FAQ Page points out that if you buy a Powerball card for every possible red ball, you'll be guaranteed to win at least the small prize. Of course, you'll have spent $52 to guarantee a $4 win, but if you match some of the white balls on those 39 cards as well, your total winnings could be higher. Other than that, there's no secret to choosing winning numbers that will improve your odds. The number draw is totally random. However, you can read my lottery winning tips that really work to find no-nonsense tips to help you win lotteries. If you have friends or coworkers who enjoy playing the lottery, you can also join together to increase your odds of winning without paying more money by using a lottery pool. Whenever the Powerball Jackpot gets really big, tons of people start entering for the chance of winning hundreds of millions of dollars. After all, about one in five people believe that the best way to get rich is to hit a lottery jackpot. But does it make sense to play Powerball? There's no definitive answer to that question. But statisticians have devised a formula to help you determine whether the risk is worth the potential payoff. To find out what that formula is and how it works, read the entertaining and informative article, Is Powerball a Mug's Game? from Slate. Which States Do Not Participate in the Powerball Lottery? The Powerball Lottery is not available in Nevada, Utah, Mississippi, Alabama, Alaska, and Hawaii. To find out if you've won a Powerball prize, you need to check your numbers. If you are contacted by someone telling you you've won a jackpot, you're probably dealing with a lottery scam. Many television stations broadcast the Powerball drawings live. You can also check your local newspaper or Google for the results online. You can bring your ticket to a gas station, convenience store, or other location which sells tickets, to let them check your winnings for you. Just be sure to sign your ticket first, to avoid being scammed out of a win. It's best to ask for the winning numbers and check yourself than to hand over your ticket and ask if you've won. There are also lottery apps that make it easy to check winning numbers. Some will even notify you if the tickets you have purchased come up as winners. If you want to check the winning numbers online, see my list of winning lottery numbers by state for the right links. Want to know more about winning the lottery? Check out How to Play the MegaMillions Lottery. Want to hear about some lottery winners you definitely won't envy? Read about these Lottery Curse Victims. Then find out how to avoid becoming one yourself by reading How to Win the Lottery Without Losing Your Shirt. If you are hoping to become a jackpot winner, find out what you should consider before claiming your prize? And if you are wondering how states use the money they bring in from their tickets, read where does lottery money go? Good luck! Where Does Lottery Money Go?